The Land O’Lakes Conferences are recognized worldwide as one of the premier teaching conferences for pharmaceutical scientists. The September Land O’Lakes Conference on Drug Metabolism and Applied Pharmacokinetics is a three-day conference that brings leaders from multiple disciplines in the DMPK arena together to share new advances in drug delivery, action and metabolism. Relevant regulatory updates are provided every year to ensure that the attendees are aware of the latest changes in drug development regulations. Refund Policy: All requests for refunds, less a $75 administrative fee, will be honored if received prior to August 26, 2019. No refunds will be provided after that date. The 22nd Annual DMPK Conference will discuss the current issues in selecting potential new therapeutic entities for drug development and current issues in drug metabolism, drug transport, pharmacokinetics, and pharmacodynamics. To provide a forum to discuss the role of absorption, distribution, metabolism, and elimination (ADME) in the pharmacokinetics and pharmacodynamics of new product candidates, including small molecular entities, biologicals, and biotechnology-derived molecules. To facilitate insight into problems and issues encountered during the drug discovery and lead optimization processes and with the interface between drug discovery and development..
To discuss current regulatory issues affecting preclinical and clinical development, within the United States and globally. To identify processes for improving the identification of successful drug candidates using ADME technologies, in-vitro/in-vivo relationships, and modeling and simulation. To discuss current ADME experimental systems and their applicability in R&D activity. To gain insight on the drug-development process from various perspectives, including industry, academia, and regulatory agencies. 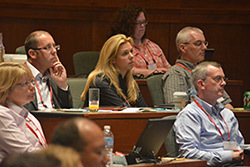 The Planning Committee for the 22nd Annual Land O’Lakes Conference on Drug Metabolism and Pharmacokinetics and Applied Drug Development, invites interested parties to submit research poster abstracts for the 2019 Conference Poster Session on Wednesday, September 18, at the Fluno Center, Madison, Wisconsin. All abstracts must be submitted via email to the University of Wisconsin by Monday, July 15, 2019. Proposals will be reviewed and evaluated by a review panel of Planning Committee members. Acknowledgement of receipt will be sent by e-mail, as well as notification of the acceptance or rejection of abstracts to primary presenters by August 5. Please do not call the University of Wisconsin to find out the status of your abstract(s). To submit a poster for consideration, at least one author must be registered for the conference. If the poster is not accepted, authors have the right to cancel their registration by the registration deadline of August 26 and will receive a full refund. Any author present at the Conference must be registered for the entire Conference. Accepted abstracts will be placed on the University of Wisconsin Web site by August 12, 2019. Kelly Turner, PhD, Principal Research Scientist, Eli Lilly & Co.
Speaker: James Gosset, PhD, DMPK Senior Principal Scientist, Pfizer Inc.
Speaker: Kari Fonseca, PhD, Scientist, Pfizer Inc.
11:45 am RIP'ing Up The "Small" Molecule Drug Discovery Book!